A few Mondays ago my friend’s son, forty-four, overdosed on heroin. The next day I took her stunned grief with me to the pastor’s study at St. John’s Lutheran Church in Oniontown, Pennsylvania. My commute from Erie has four legs: I-79 South to US-19 South to District Road to Mercer Road. For seventy minutes gray trees and rolling fields heal me, but on this day my mind was on iffy roads and my friend. She and her husband had long anticipated the knock at the door and the crushing news. My wife and I used to have the same nightmares about our son, now thankfully clean. As I thought about the numb terror of fresh loss, a line from Philippians visited me: “Your citizenship is in heaven.” Good sermon theme! I started to flesh it out. When political candidates carpet bomb each other, when explosive vests cut down the innocent, when El Nino and Zika lead the news, and when nasty heroin is as cheap as beer, then heavenly citizenship sounds, well, heavenly. My point, of course, wouldn’t be to reject this life, but to remember that we have a home over the horizon. Not particularly uplifting, but not all sermons can be sunbeams and dandelions. I looked forward to getting to church and putting the ideas on paper. Alas, a snowy parking lot stood in my way. But since secretary Jodi’s truck was in its spot, I bravely punched the accelerator. Turns out my burnt-orange, bulbous Chevy HHR can’t compete with four-wheel drive. “Man, am I stuck,” I reported to Jodi, who didn’t know when the plow guy would get to St. John’s. Might be evening. “We’ll get you out somehow,” she assured me. I sulked at my desk. Wait-and-see isn’t my best mode. The sermon I pecked away at would sound whiny, I could tell. “I hear something,” I said. “Don’t know what.” Then out my window passed a bundled up man with a long beard pushing snow with an old tractor. The blade was behind the driver, a configuration I had never seen, but he was blazing me a trail. “He lives over there,” Jodi pointed. He had seen my problem and arrived unbidden. Shoving snow this way and that, he kept at it, like a man subduing a wooly mammoth with a straight razor. Watching him ride into and out of view, I came to love that tractor, pale red, faded by decades of sun and squalls. It must have been shiny once, but endurance gave it a different beauty. 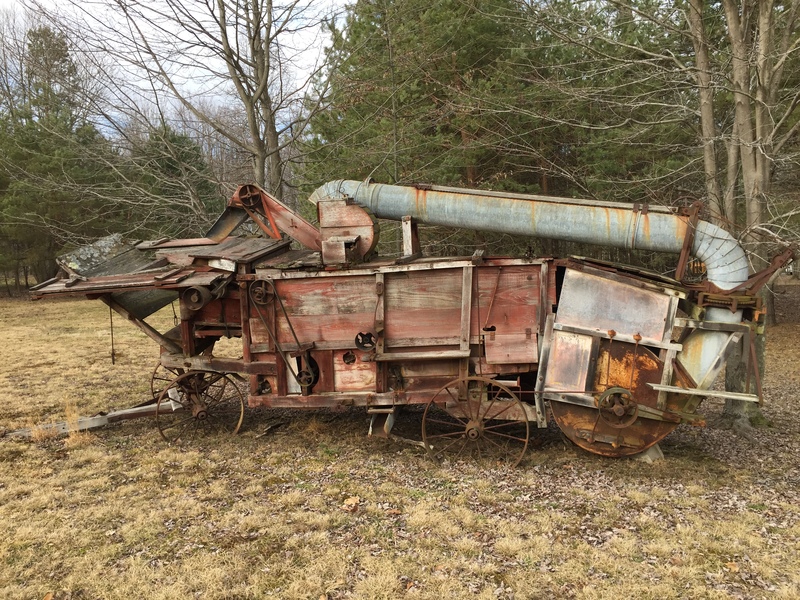 Hope, I think, is the color of my Samaritan’s tractor. I finally understood why Jodi wasn’t concerned. And the sermon in process took on a glad color. “Our citizenship may be heavenly,” I now plan to say, “but God resides in Oniontown, too.” Then I’ll tell the folks about our neighbor and his tractor. And I’ll tell them about hope. *This essay first appeared a few weeks ago in Greenville, Pennsylvania’s, newspaper, the Record-Argus. “… not all sermons can be sunbeams and dandelions.” Beautiful. I realized this reading Marilynne Robinson’s novels too, what writers pastors are! I could read your prose all day long!! Aw . . . thanks, Nancy. John, I loved this, especially the snow problem. 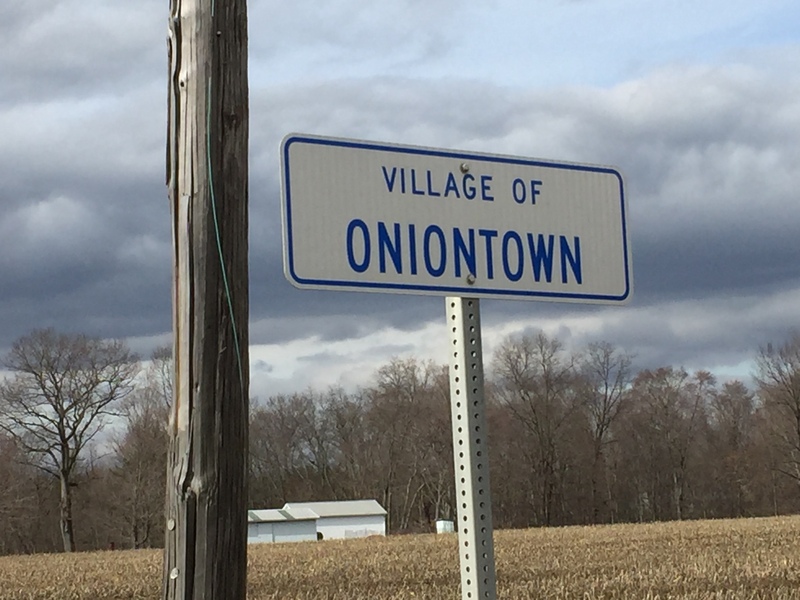 But the winner for me is Oniontown, the name itself. I love places with practical, descriptive or associative names.